The sleepy town of Baisha rests at the bottom of the Jade Dragon Snow Mountain in western China, and is known for the ethnic minorities that live there, and the exquisite embroideries that they produce. We were lucky to stumble onto Baisha, after cycling out of Lijiang without a fixed destination. We ended up staying there for a week to soak up the chilled out atmosphere and to explore the rich array of textiles. We had finally found our 'beach' after 5 months of travelling. As a clothing designer, I was in my haven. There were tens of shops selling both new and antique textiles, and every day I would look at the embroideries in awe, chatting to the owners to learn about the pieces they had collected. Many were made by the local ethnic minorities, which have great tribal names like Yi, Dong, Bai, Yao, Naxi, and Miao. The level of detail on the antiques is extraordinary, and many would make fine examples of Chinese ethnic embroidery in any museum or gallery. I couldn't believe they were just there, hanging up for anyone to touch and see! So I took as many pictures as I could, to share with you the wonderful embroideries that exist in this tiny town in rural China. Many of the pieces on display were baby carriers, and this is still how young children are carried around today on their mothers backs, wrapped in beautifully embroidered pieces of fabric. The mothers don't tend to use the antique carriers because I would imagine they are too valuable, but there were many mass produced options with machined embroidery, which are more popular. This is a speciality of the Bai minority that still live and work in Baisha. They make tie dyed pieces on cotton fabric, and sell them in this area of the Yunnan province. 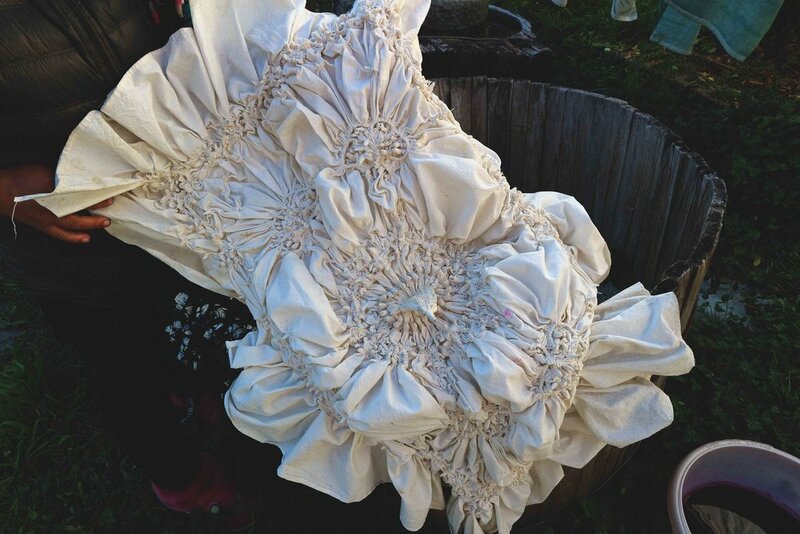 Each piece takes hours to make due to the intricate tying of the fabric, and one of the ladies showed me a work in progress in the courtyard of her shop. One of the most incredible things to witness was seeing the workshops where the finest level of hand-embroidery was still being produced to this day. A handful of incredibly skilled women are still in training to become master-level embroiders, and work long hours every day to hone and develop their skills. We were shown around the on-site gallery which displayed hundreds of their works, all exquisite in the level of skill and detail. All of the pieces they produce were photo-realist in style, and traditional in content so imagine an image of an oriental woman in a garden, or a fish swimming in a bowl. Despite the content not appealing to me, you can't help but appreciate the level of work involved. Some pieces even take the master a year and a half to complete! If you couldn't have afforded the vintage pieces like me then not to worry! There were hundreds of newly produced embroideries available that had been mass produced by machine, how very China. Lots of them however look quite cheap and brash due to the colour combinations, but if you hunt around you can find some nicer ones that look a bit more vintage. These are more around the £10-£40 mark, so get negotiating. I managed to get prices down to under half of the initial price on most sales, so start low and work your way up. 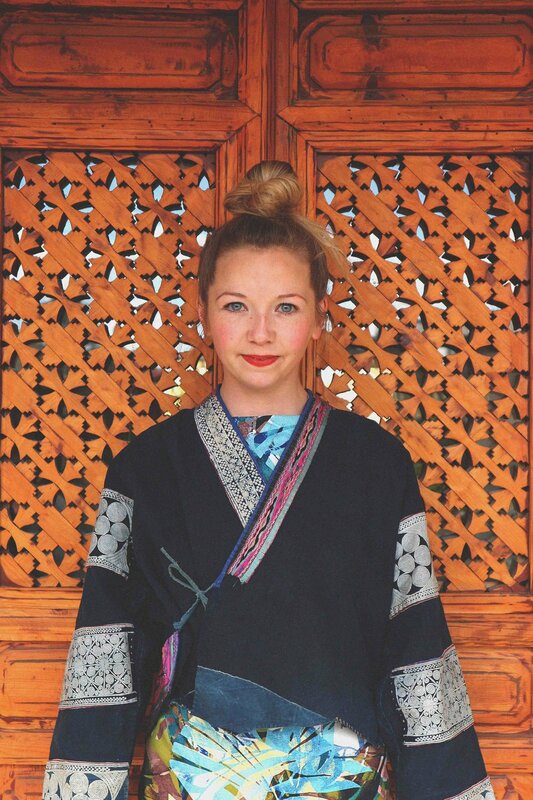 Along with the embroidered baby carriers and antique pieces of fabric, you can find a few minority tribe garments including vintage floor length dress jackets from the Miao minority, pleated flared skirts with hand cross-stitched trims, and some cropped jackets in denim fabric with embroidery. 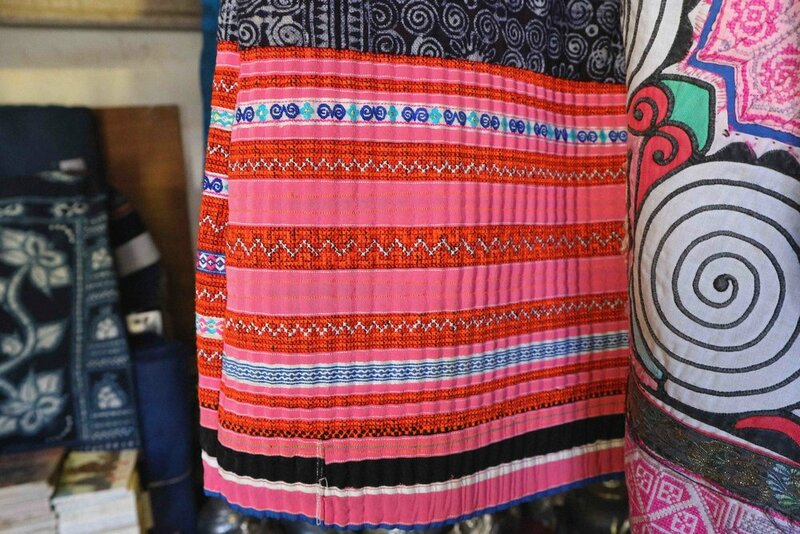 Many older women of the minority tribes still dress in traditional clothing even today, and you only have to walk down the street to spot them in their unique attire. 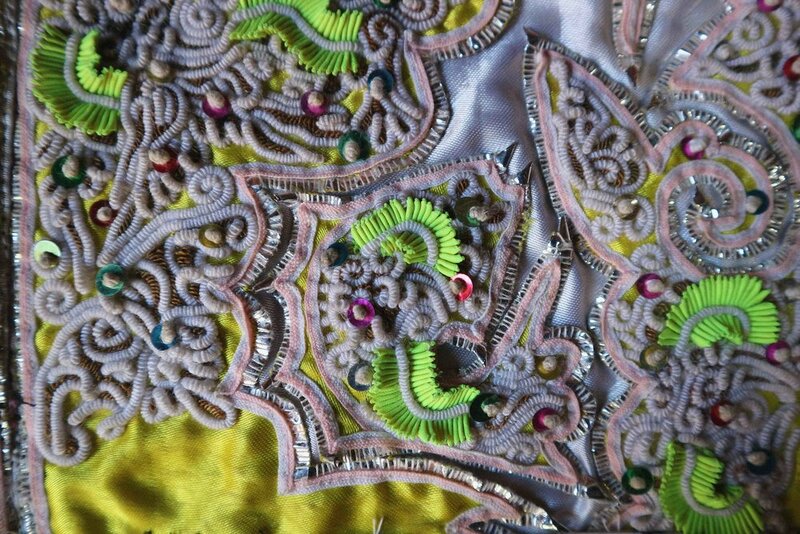 Close up of a vintage Miao dress jacket that I purchased. With beautiful hand embroidery and fastenings. Some of these were selling for £400! The reason why I loved Baisha so much was mostly down to the pure creativity and skill of the people that lived there. Seeing textiles of this level really inspired me to want to get making and using my hands. An amazing quality of the Chinese is that they work so hard, regardless of everything else they get on with whatever they put their minds to and get the job done. 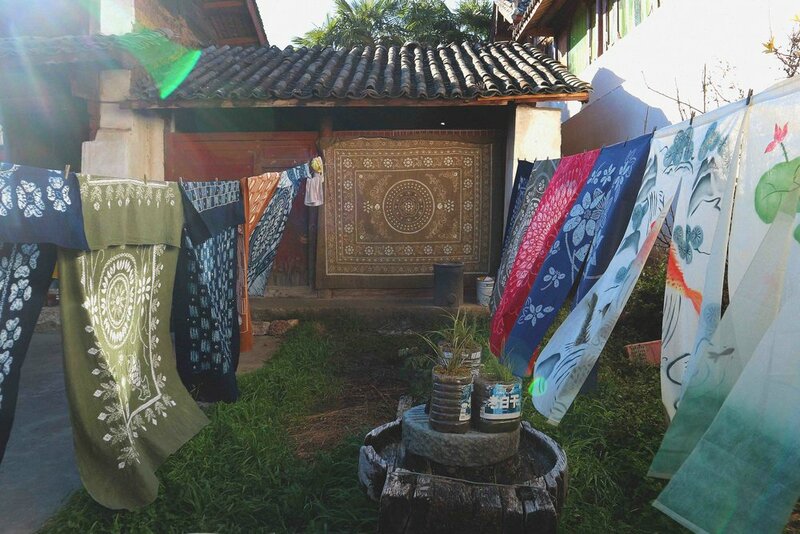 Whether that be selling, building a new home, or producing beautiful textiles like these ones, they are brilliant at working quickly and efficiently, and some are incredibly skilled. I feel so privileged to have spent so much time looking at these exquisite pieces of antique fabric, to me they really demonstrate Chinese minority embroidery and textiles at it's finest.